Here are 10 best free Online PDF to PPT Services. These free web services let you convert PDF files into PowerPoint presentations easily. You only require a web browser to use these free tools. These have various features like: upload an input PDF file and download converted PowerPoint file, some sites support bulk or batch mode for conversion, input is simple PDF and output formats are PPT and/or PPTX (PowerPoint 2007-2013), some let you convert file from specified URL, some provide the converted file link on the same web page while others send you the link in your email, and many more. 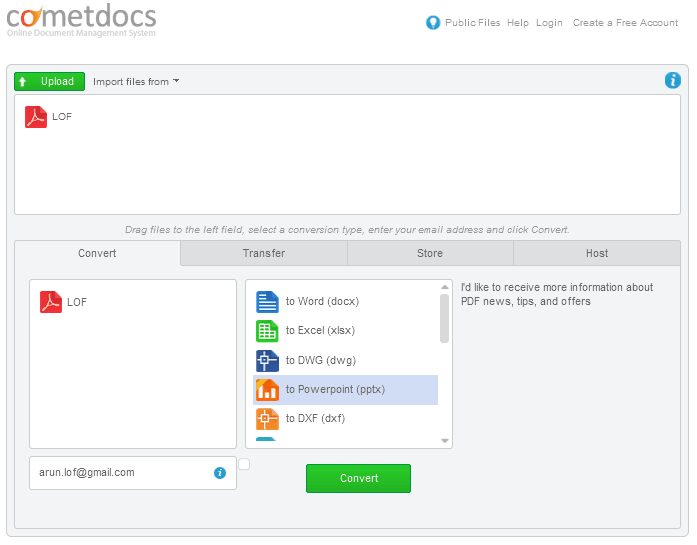 You can also try best free DOCX Viewers, Online Excel To PDF Converters, and OCR Software. online2pdf.com is a simple to use and easy to understand website which provides various PDF conversion facilities. It also provides the facility of PDF to PowerPoint (PPT and PPTX) conversion. To do this click "Select files" button and browse for file(s). Now from "convert to" dropdown choose PPT or PPTX. Finally click Convert button to start the process. It supports maximum of 50 page conversion. After successful completion you can download the converted PowerPoint file to your PC. pdftoppt.com is a free web service which lets you convert PDF to PPT. You have to provide your email address to use this service. First select your PDF file by clicking "Select your file" button. In next step provide your email address and click "Convert Now" button to start the uploading process. You will get an email with a link of converted file. 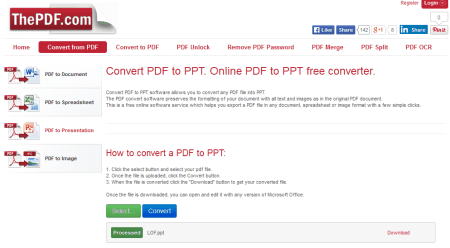 freepdfconvert.com is a web service which lets you convert PDF to various formats including PowerPoint. You have to click on "PDF to PowerPoint" tab on your screen. 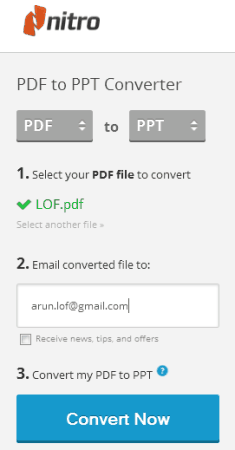 Now you can select file or URL of a PDF file to convert by clicking the respective link. For e.g. if you want to convert a file, click "Select files" button. Provide your email address if required. Finally click Convert button to start the process. After finishing the uploading, your converted file will be available to download from the same page. The output format is PPTX. Only first two pages of PDF file will be converted to PPTX. 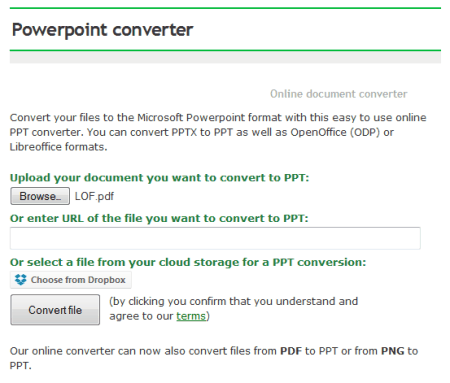 pdfconverter.com lets you convert your PDF file into PowerPoint in simple 3 easy steps. It supports other office document formats also. In step 1 you have to click "Choose File" button. Select the file by browsing and in step 2 provide your email address. In step 3 click Start button to start uploading your file. You will get an email with a link of converted file within few minutes. document.online-convert.com is a multi-format conversion web service. It also lets you convert PDF file into PPT/PPTX format. Just click Browse button to select your file and click "Convert file" button to start the process. You can also choose input file from your cloud storage account like Dropbox. Your converted file will be available to download after successful conversion. Other conversion output formats this site supports are: Convert to DOC, DOCX, Flash, HTML, ODT, PDF, RTF, TXT etc. smallpdf.com is a simple and user friendly website for converting PDF to Office document. You can use "PDF to PPT" option by clicking PDF to Office icon. Now drag and drop PDF file to it or click "Choose file" button to browse for a file. You can also select file from Dropbox or from Google Drive. After selecting; the file will start uploading automatically. Within few seconds you will be able to download the converted file. Download the file to your PC or save it to your cloud storage account. convertpdftopowerpoint.com is a free web service which lets you convert PDF to PowerPoint online. 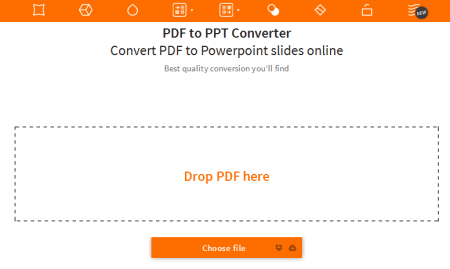 You can convert PDF to PowerPoint in just 2 simple steps. In step 1 choose the file by clicking Browse button. In step 2 provide your email address and click Send button to start uploading your PDF file. You will get an email within 30 minutes with a converted file link. You can than download it to your PC. 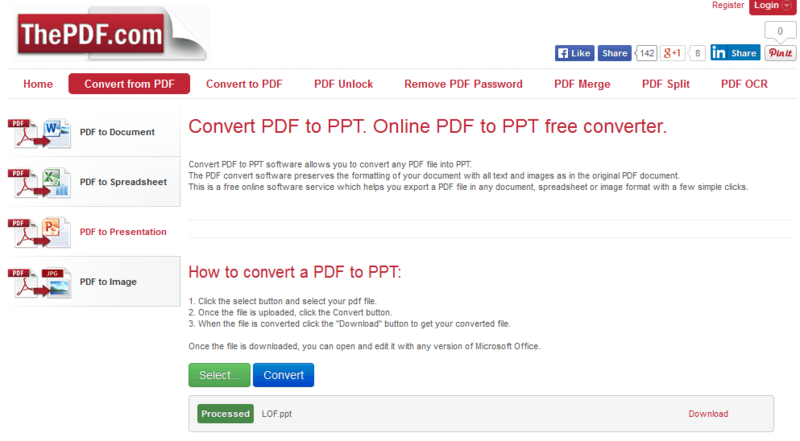 thepdf.com is a simple to use web service which lets you convert PDF to PPT online. To use this service click Select button to browse for an input PDF file. After selecting the file click Convert button. Your file will start uploading and after successful conversion you will be able to download the file from a given link. It maintains the original formatting and images in original PDF when converting. This website also supports converting of PDF into Word, Excel, and Image formats. 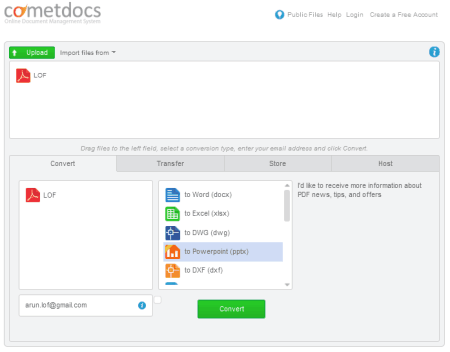 Cometdocs.com has an easy to use online File Manager which lets you convert files from one format to another. It also supports converting of PDF into PPTX. To use this free service you have to first upload the input file to their server. Now drag and drop the uploaded file to the Convert tab. Now choose the PPTX as output format and provide your email address. After clicking Convert button you will get an email with a converted file link. free-pdftoppt.com is another website which lets you convert PDF to PPT easily. Just select the PPT format from the dropdown list. Click "Select file" button to browse for a PDF file on your PC. Now click "Convert Now" button to start uploading. The maximum size limit for input PDF file is 10 MB. After finishing the process you can download the converted PowerPoint file on your PC. The output format is PPTX (PowerPoint 2007-2010).